Sorry for answering you so late, i couldn’t earlier because of work. Thank you for your answers. How can i find out that Custom URL? 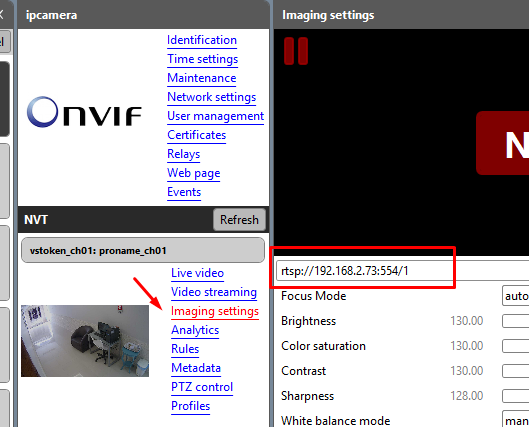 This is what the Onvif DM shows with the cam. In NCS add the camera using Custom URL. Most likely port number 554 is not necessary to use. I have already tried the rtsp stream and it works perfect on the vlc player for example. But the goal is to get that camera working on my nvr recorder and on my dreambox satellite receiver as an IP-TV channel (This ist still working perfect with a Instar Camera). I tried all different settings, like ONVIF, RTSP, HTTP and so on, but no results at all. Only in VLC or Browser it is fine. The Instar Camera works fine with all my systems. I don´t know what i can do anymore. By the way: The Instar Camera is on ONFIV 2.4 and the DB Power Cam on 2.5. I can help you with Netcam Studio. Is NCS what you call the “nvr recorder”? What is the model of the DB Power camera? What is the URL that onvif manager reports? No i got it to work. Thank you very much. My fault was that i did not select rtsp_tcp as stream type. Finally i got all of my Cams working with Netcam Studio. Well done Henrik … again !! !